Abstract: Just like the world of high-end CRT's, there is a world of high-end TFT displays designed with the professional in mind. For the average person a 15" TFT display is more than sufficient. The cost is higher then that of a CRT but still manageable for those looking for something equivalent to a 17" CRT. However, for those of you looking for something a little bit more then the average LCD, don't fret. Just like the world of high-end CRT's, there is a world of high-end TFT displays. Designed with the professional in mind, these displays are pricey, but offer some of the largest screen sizes you can get in an LCD panel, and features you won't normally see elsewhere. The Display comes with the following: power cord, AC-adaptor, long analog display cable, driver disk, manual. For those of you who work with programs like AutoCAD, Microstation, Maya, or Photoshop all day, the leap from a good quality 19" CRT display to a flatpanel can be an expensive proposition. However, the benefits can be substantial in terms of image quality, picture sharpness, and decreased eyestrain. 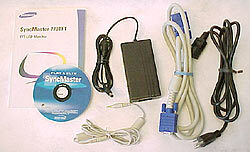 A flatscreen display like the Syncmaster 800TFT fills one such role in the high-end TFT marketplace. Sitting comfortably at 18.1" with a resolution of 1280x1024, this is not a display to be trifled with. It has a dot pitch of 0.2805mm (typical LCD dot pitches run around 0.297mm) which brings to life, very clear and crisp imagery. The LCD panel has the widest possible viewing angle of 80/80/80/80 degrees. There's even room for a USB hub on the back of the display stand, though it wasn't included with the unit we tested. Like many flatscreens, this display has a removable stand so it can be wall mounted. Additionally, the 800TFT display connects to the computer with either a 15-pin D-sub Analog or Sun 13W3 connection. 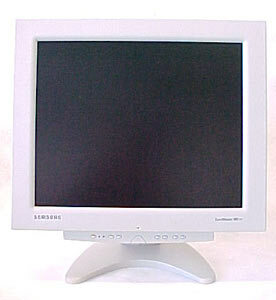 The 13W3 display connector is a proprietary standard used on Sun and SGI systems. The connector has 3 large coaxial pins and 10 small pins. We always suggest you test any flat panel display you are considering getting in the store before you pay for it . LCD panels are very complex components and most manufactures only guarantee a display to be 99.9% free from defect. That means there can be up to 3 or 5 broken pixels before the display is considered "broken." Broken pixels are individual pixels in the display panel which are stuck on a certain colour, are constantly dim, or are always off. Depending on the location and intensity of a broken pixel they can be next to invisible, or glaringly obvious. While the Samsung 800TFT we tested had a flawless panel we have in the past encountered broken pixels with other manufacturers displays. Bottom line, it pays to check the display first regardless of who makes it.